Encore Champs had luck on his side for his debut hurdles win at Wetherby yesterday but may still be a name for the future. 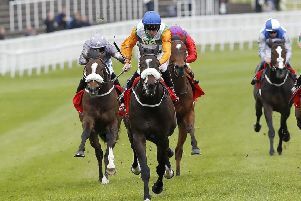 Warren Greatrex’s four-year-old beat smart Flat stayer, and fellow hurdling first-timer, Lord Yeats fair and square by three-and-a-quarter lengths under Gavin Sheehan in division one of the racinguk.com Novices’ Hurdle. But after the first two had engaged in a protracted duel up the straight, it appeared David Pipe’s 14-1 shot Extra Mag – another new to hurdles and on his British debut – was coming to beat them both when he unseated Tom Scudamore at the last. Greatrex was not complaining, of course, and believes there will be better to come from Encore Champs when he goes up in class and meets a deeper field after the three main protagonists pulled well clear of the rest yesterday. “He’ll be a better horse once he’s dropped in,” said the Lambourn trainer. There is every reason to believe winner and runner-up, 9-4 and 11-10 favourite respectively, will both improve again. He’ll be a better horse once he’s dropped in. That was the plan, but Gavin said when he got to the start no one was keen to go on, so he thought he’d be better handy. He’ll be better in a better race with a bigger field. Lord Yeats was beaten less than nine lengths in the Ebor Handicap up the road at York this summer, and made a satisfactory start over jumps. Elsewhere on the card, there was an impressive win for Fabianski, who won by 17 lengths at 20-1 in the opening wetherbyracing.co.uk Juvenile Maiden Hurdle, on jumping and stable debut for Rebecca Menzies. Then, later on, the admirable Theflyingportrait won in the Bet At racinguk.com Handicap Chase. Jennie Candlish’s nine-year-old grey, successful at this course in a similar handicap last month, is thought to prefer quick ground. But he did not seem to mind the rain, or good to soft surface, putting up a career-best performance carrying 11st 12lb and jumping very fluently under Sean Quinlan to scoot clear by 14 lengths as 9-4 favourite. There were winner’s smiles, too, for Scottish trainer Stuart Coltherd after son Sam had steered five-year-old Pookie Pekan to a four-and-a-half-length win in the Northern Boys Play Crown Green Bowls Handicap Chase. Coltherd senior was expecting a big run from the 11-4 joint favourite. “He’d run a nice enough race first time over fences in a hot novice chase, and he was back down in handicap company here,’’ he said. “We were happy to bring him here. He won over hurdles - although he might have been a little fortunate - but it’s a lovely fair track with nice fences. Sheehan made it a double with the second of his only two rides on the card when Shantewe quickened up well on her debut to win the closing British Stallion Studs EBF Mares’ Standard Open National Hunt Flat Race by five lengths at 16-1 for Jamie Snowden.